Women were thought to be more sensitive and spiritual than men in the mid-19th century, so people weren't completely surprised to discover that spirits nearly always chose women to serve as "mediums" to convey their messages to the world of the living. The medium was the central figure in the Spiritualist faith. Women didn't choose to be mediums -- the spirits chose them -- and they often found themselves doing things they wouldn't have believed women could or should do. Mediums not only channeled messages from the dead in small seances, but they also stood up in front of large groups and lectured. When they did so, they were in a trance. Nevertheless, some of these "trance speakers" became hugely successful on the lecture circuit, the historian Ann Braude writes in her book, Radical Spirits: Spiritualism and Women's Rights in Nineteenth-Century America. 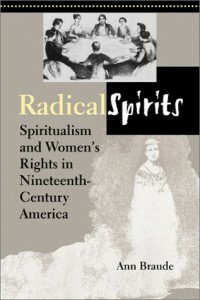 To close the loop on our discussion of the role Spiritualism played in preparing American women for a public role in American life, women had been making inroads in some religions, but had not served a primary role before Spiritualism, Braude writes. And religion went a long way toward setting the tone in 19th century life. Spiritualism began to take shape in 1848, the very year, and in the very same area, the Finger Lakes region of New York State -- the so-called "Burned Over District" -- that gave birth to the organized women's rights movement. "Dissident Quakers" were at the center of both of these radical movements, and considerable overlap ensued. Quaker women already enjoyed more freedom and prestige than women in other religions, but women who were or would become Spiritualists were so aggressive in pushing for a central role for women that they put off even some of their fellow feminists, Braude writes. None of the women who put together the Seneca Falls Convention believed a woman should preside over such an assembly, for example. So James Mott, Lucretia Mott's husband, was pressed into service as president of the meeting that established the women's rights movement. However, when the group met again in Rochester two weeks later, a faction of the women, most of whom later became Spiritualists -- notably Amy Post, Rhoda DeGarmo and Sarah Fish -- insisted that a woman should preside. Mott and Elizabeth Cady Stanton "stoutly opposed" the motion as "a most hazardous experiment." They wanted James to head this gathering as well. The meeting was a contentious one, but in the end, Abigail Bush, a Presbyterian who would become a lifelong Spiritualist, was elected president. The world did not come to an end, and the idea of women as leaders took one step forward. Thanks to my friend, the historian Rima Lunin Schultz, for putting together a list of books for me about how Americans' ideas about women took shape in the 19th century. As Women's History Month winds down, you might want to visit Birth Activist's "Women's History Blog Carnival" about "women who have led the way in birth." Elizabeth Blackwell was the first female doctor in the United States, but it’s her sister, Anna, I would like to consider today. Anna Blackwell was a Spiritualist; that is, she believed it was possible to communicate with the dead. She wasn’t alone. Many prominent families, especially in the Northeast, contributed passionate believers to this native American religion. Harriet Beecher Stowe, author of Uncle Tom’s Cabin, had two siblings who were Spiritualists. Today perhaps most people view Spiritualism as a hoax, but in the mid-19th century, when electricity was beginning to be harnessed and people realized there were things about their world they couldn’t see and didn’t understand, Spiritualism attracted a huge number of followers. 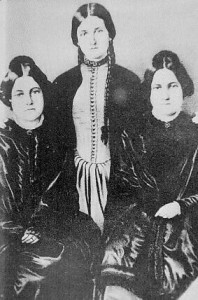 Spiritualism sprang to life in a small town near Rochester, N.Y., in 1848 after two sisters, Kate and Margaret Fox, 12 and 14 years old, claimed that the raps that only occurred in their presence were urgent messages from a dead man they said was buried in the basement of their house. When the sisters moved into Rochester, they were taken up by an enthralled community of progressive people ready to move away from the grim outlook of traditional religions, and traumatized by the virtually universal untimely loss of children and other loved ones. “The hunger for communion with the dead gave Spiritualism its content, transforming what may have been a teenage prank into a new religion,” writes Ann Braude, author of Radical Spirits: Spiritualism and Women’s Rights in Nineteenth Century America. Many of these people discovered that they, too, could communicate with the dead. Virtually all these mediums were women, and even young girls. Spiritualism was not a particularly organized religion, but it did pick up a guiding philosophy from the Quakers, abolitionists and feminists who swelled its ranks. One of the most important tenets of Spiritualism was gender equality. “Not all feminists were Spiritualists, but all Spiritualists advocated women’s rights,” Braude writes. Documentation is scarce, but membership estimates range from a few hundred thousand to 11 million at a time when the United States population was 25 million, Braude reports. What does Spiritualism have to do with the birth story? According to Braude’s book, this colorful native American religion played a major role in preparing women to occupy a role on the center stage of American life. We’re going to explore that connection this week. Human beings do not have a nature. What we have is history.